The Blue Lagoon story began in 1950, when New Zealander Captain Trevor Withers came to Fiji to investigate starting up a tuna fishing venture with partner Harrold Gatty. While the tuna venture faltered (and Gatty went on to found what's now Fiji Airways), Withers used his boat, Turaga Levu -- meaning great chief -- to start his fledgling cruise business to the Yasawas Islands. After a slow start, the company prospered. In 1966 Withers sold the company to Captain Claude Millar, a fellow New Zealander, and retired in the Yasawas. At one point, Blue Lagoon had a fleet of about five ships, including the luxury vessel Mystique Princess; all but one have been sold. Today, the cruise line is owned by South Sea Cruises, which operates a fleet of sightseeing day-trip vessels in Fiji, as well as ferries that transfer passengers from the "mainland" (the main island of Viti Levu) to the Mamanuca Islands. This 68-passenger catamaran offers three-, four- and seven-day cruises through Yasawas Islands in the South Pacific. From its humble start in 1954 when its founder Trevor Withers struggled to get one paying passenger on his ship, the company has grown and contracted over the decades and today is a successful operation owned by one of the leading tourism operators in Fiji. 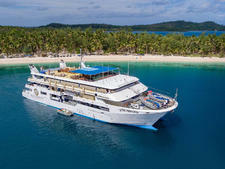 Blue Lagoon Cruises has one ship, 68-passenger, 16-year-old Fiji Princess, which has been part of the company since 2004. The onboard ambience is casual, the pace unhurried. Daily cruising time is no more than four hours per day, leaving plenty of time to enjoy water sports or simply relax on shore and do nothing at all. Each morning, the Fijian crew awaken the more energetic passengers at 6 a.m. for an eye-opening swim. Most passengers prefer to wait until they've indulged in the breakfast buffet before snorkeling in the balmy turquoise waters or reading in a hammock under a palm tree. Meals, offered at one seating with no assigned tables, focus on fresh seafood, tropical fruits and traditional Fijian cuisine. Included are hearty breakfasts, morning and afternoon tea (usually on the beach), barbecues, and lunch and dinner buffets. A highlight of each trip is the magiti, a Fijian feast of pork, chicken, fish and vegetables wrapped in palm leaves and cooked in a pit called a lovo onshore. No wonder the crew's favorite slogan is: "The more you eat, the more you float." Dress is casual. Pack your swimsuit, shorts, T-shirts, sunglasses, hat and flip-flops. Modest clothing is recommended when visiting the local villages (no tank tops, hats or swimsuits). Highlights include visiting a village school and experiencing the ancient yaqona (kava) ceremony, as well as traditional songs and dances. There's a day at Blue Lagoon's own island, Nanuya Lai Lai, where beach and water activities precede a traditional lovo feast and guitar concert. Activities include swimming, snorkeling, kayaking, fishing, bush walking and more. Blue Lagoon attracts a diverse passenger base, from honeymooners and families to active seniors. The majority of passengers hail from nearby Australia and New Zealand, followed by the U.S., U.K. and Japan. Fiji Princess is currently the only ship in the Blue Lagoon fleet. The vessel offers 34 cabins, and the 117- and 142-square-foot accommodations each feature a window. Fiji Princess, a catamaran, was originally Le Meridien Pearl of Seychelles, owned by Rivages Croisieres, a French company. In the Blue Lagoon fleet since 2004, the ship features a small pool, spa and walk-around decks. Blue Lagoon sails three-, four- and seven-day itineraries to the Yasawa Island Group, comprised of six major islands plus numerous islets and coral cays. Twice a year, the company offers a six-night historical and cultural cruise to remote islands like Kioa and Taveuni, as well as six-night diving cruises throughout the year. For passengers wishing to combine a cruise with an island stay, Blue Lagoon picks up and drops off guests at several resorts in the Mamanuca Islands.